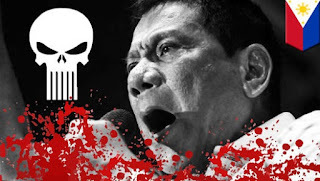 MANILA, PHILIPPINES — On Monday, Philippine President Rodrigo Duterte bragged that’d he has killed people during his tenure as mayor of Davao City. He was speaking to business leaders at the presidential palace in Manila when he boasted, “In Davao I used to do it personally. Just to show the guys if I can do it, why can’t you?”, reported the BBC. Duterte explained that he’d drive around the city on his big boy bike and would go on patrol. He also admitted “I was really looking for an encounter so I could kill,” reported CNN. Since being voted in as president this summer, Duterte’s extrajudicial death squads have reportedly killed around 6,000 suspects during his bloody war on drugs.